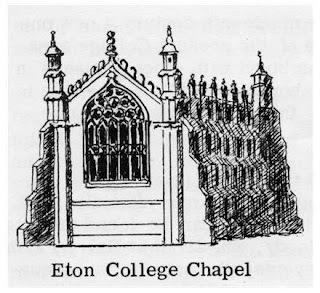 The fifteenth century brought a new force into the parish - Eton College, which was founded in 1440. It is one of the earliest brick buildings in England and well over two million bricks were used in its construction between 1442 and 1452, most of which were baked at ' ie Slowe '. Without a doubt a few villagers would have joined the labour force, if only as labourers and one of the elms needed in the construction of the bell tower came from Eton Wick and another from Boveney. Whether the presence of the College was welcomed or not by the villagers and townsfolk it is not possible to guess, but once established with the Provost and Fellows, its almsmen, chaplains and clerks and seventy scholars, the villagers could not but be very conscious of it for several reasons. For a short span of years soon after its foundation, the Provost was Lord of the Manor of the Royal Manor with all the associated responsibilities and privileges. In the year 1448 alone the tenants and freemen of the manor were called to the Manor Court at least ten times. The College was also granted the right to hold a weekly market, a six day fair following the Feast of Assumption and a pig fair each Ash Wednesday. No doubt villagers visited them all to buy and sell and just to enjoy the occasions. The College was also given the right of granting indulgences (the remission of punishment for sins in repayment for penances) to all those who visited the new College Chapel. Inevitably for a few years at least, Eton was thronged with visitors who brought as many difficulties as blessings - overcrowding, shortage of food and even leprosy. Most of the land which was granted to the College was bought from freeholders of Eton or from part of the Manor of Eton owned by the Huntercombe family, or else had been glebe land, that is land which had belonged to the church. However, even added together these did not amount to a great acreage; but in the coming centuries the College did become an important landlord within the parish, though more by virtue of being a leaseholder than an owner. 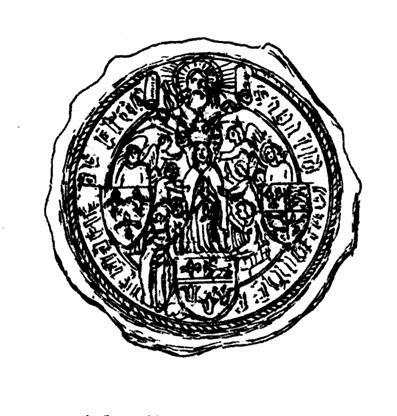 A survey of the Royal Manor in 1548 shows that the Provost and Fellows of the College were the principal tenants. This land was mostly sublet and much of it lay within Eton Wick. In numerous other ways the College must have influenced the lives of the town and village folk as employer of labour and user of produce, and even for the education of a few of their children; for not until the nineteenth century did it become an almost exclusive school. But perhaps the most important change brought about by the foundation of the College was the demolition of the old parish church and the building of the College Chapel to replace it. The right of advowson (the presentation of a clergyman to a living) was also granted to the Provost and Fellows. Not until the second half of the eighteenth century was there to be another church in the parish; townsfolk, villagers and scholars were all entitled to worship in the Collegiate church. The Provost became the Rector and he and his chaplains, or conducts as they were known, were responsible for the spiritual welfare of the parish as well as the school. From 1769 there was a small chapel of ease in the town of Eton though this early building compared very poorly with the College Chapel which was still the parish church. In 1852 a new church was built in Eton to replace the eighteenth century building and in 1867 a chapel of ease was built in Eton Wick and dedicated to St John the Baptist. Not until 1875 did the Provost cease to be the incumbent when the Rev John Shepherd became the first Vicar of Eton since the Middle Ages. Because the Provost was the Rector, he was also the tithe owner. He and the College had a right to a tenth of all the produce of the parish with the exception of the tithe-free land owned by the College itself. In the early centuries this was certainly paid in kind, a tenth of the harvest, the hay, lambs and all the rest, but by the nineteenth century at the discretion of the Provost as Rector and tithe owner it was usually paid in money. An old account book of John Atkins of Bell Farm shows that he paid £27 12s 0d for the year 1832. Even cottage gardens were not exempt and when tithes were commuted to money under the Commutation Act of 1836 the tithe payments were set out for all the land in the village.